Mickey Mouse is coming to Perth, and he's bringing all of his friends with him in a brand new stage show. Disney Live - Mickey's Magic Show will be at the Riverside Theatre, Perth Convention and Exhibition Centre, from Friday 27th December until Sunday 29th December, 2013. Join Mickey Mouse, Minnie Mouse, Donald Duck, Goofy, Alice, Cinderella, Princess Jasmine and a host of Disney characters for this one of a kind stage show. Mickey's Magic Show is proudly presented by Disney Live!. This production features fantastic magical tricks and great musical numbers full of energetic dancing and singing. The combination of Disney characters and illusions is impressive and very entertaining. The show is really aimed at young children but the whole family will be entranced and entertained by this show. Mickey and his friends come together with a world-class illusionist and perform wonderful magic tricks right before your very eyes. See the Fairy Godmother change Cinderella's rags into a beautiful ball gown, watch as Princess Jasmine rises off the ground and floats in mid-air, or wonder at the enchanted dancing brooms from Fantasia. Disney Live - Mickey's Magic Show is a not to be missed event that the whole family will enjoy and fondly remember. 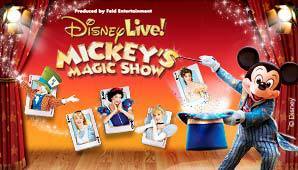 Tickets for the Disney Live - Mickey's Magic Show are available from Ticketek. Ticket prices are $38.50 per person for A Reserve seating and $29.50 per person for B Reserve seating. Family packages are also available. For further information about this event, including show times, visit the Disney Live - Mickey's Magic Show website.